Hello scholars! In the LA area? 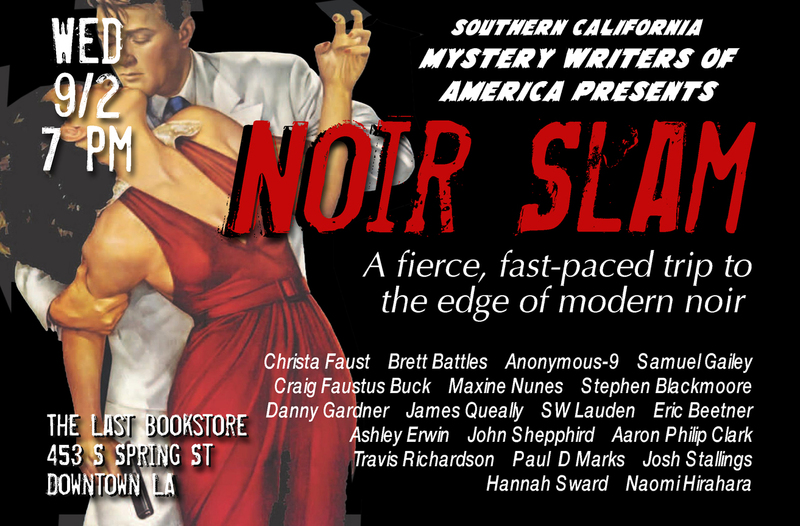 Why not check out the “Noir Slam” event hosted by the Last Book Store in Downtown Los Angeles this coming Wednesday September 2. Presented by the Southern California Mystery Writers of America, the event will feature Christa Faust, Brett Battles, Anonymous-9, Samuel Gailey, Craig Faustus Buck, Maxine Nunes, Stephen Blackmore, Danny Gardner, James Queally, SW Lauden, Eric Beetner, Ashley Erwin, John Shepphird, Aaron Philip Clark, Travis Richardson, Paul D Marks, Josh Stallings, Hannah Sward, and Naomi Hirahara. 453 N. Spring St, Downtown L.A. This entry was posted in Events, Film Noir and tagged Film Noir, Last Bookstore, Noir, SCMWA, SoCalMWA, Southern California Mystery Writers of America. Bookmark the permalink.